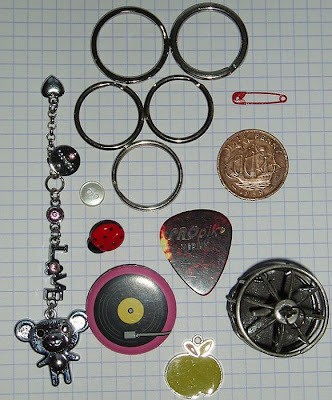 I seem to have acquired an accidental collection of what I think of as "foundlings" - stuff I find on the street/bus/train. 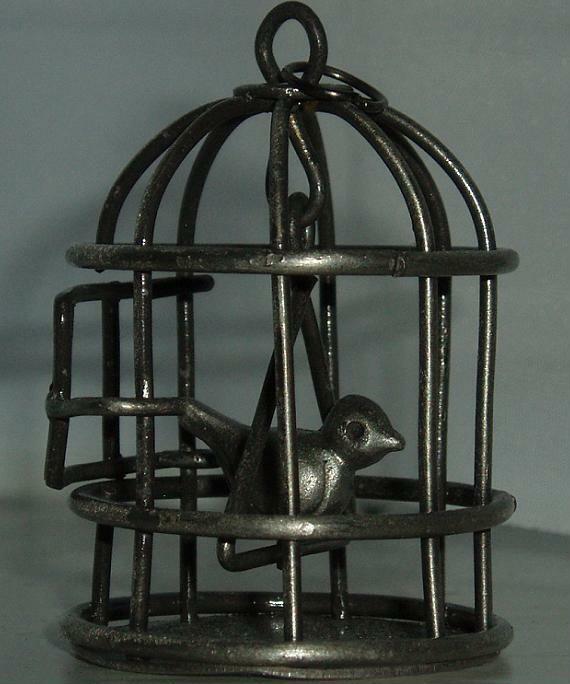 Not easy to photograph, being so small and intricate, but it is a tiny bird-cage, with an opening door, and a little bird on a swinging perch. 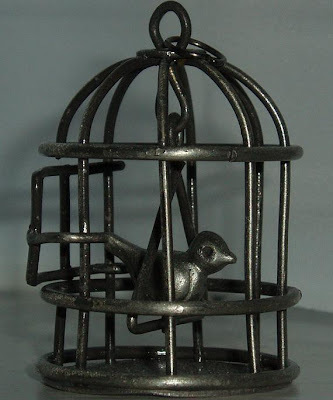 It's just ordinary metal, no marks, about 2.5 inches tall and someone has clearly taken a lot of time to make it. Does anyone else collect "foundlings"? Do you have your own set of unwritten rules? wow you got sharp eyes to spot such lovely things, never thought of that. The bird cage charm is gorgeous! Thanks for dropping by my blog btw, Following you! It's surprising what people leave lying around the street. I always feel sorry for little children's gloves or toys that have fallen from a push chair. These are always put on the nearest wall. Whether they are found or not I don't know. Lost cuddly toys make me so sad. Love the bird cage charm! And yes, I collect 'foundlings' - no rules but mostly miniatures and nature items. I love finding goodies washed up or left behind at the beach. Heading there tomorrow to collect away! I used to, not anymore. My friend & I had a bad habit of it. A gave her a squirrels tail in a bag that I had found on someone's lawn, which she left on the tale during Easter dinner with her family & she sent me a used fork she found on the bus with hairs, pasta & god knows what else on it. So, no, we didn't have any rules. Should have though, lol. @ Sir Thrift-A-Lot - sounds like you were into the "extreme sport" version. Respect. So glad you shared the detail on the bird cage! Sir Thrift a Lot, that is too gross! Haha. The bird cage is a real charmer! My best ever finds - an angel that I found in my parking space, she now hangs from my rear view mirror. Love your blog. VERY cool collection! I'm in love with that coin!